“What are you going to do with that?" Thousands of undergraduates are currently majoring in religious studies in North America, yet most religious studies programs have only limited and anecdotal knowledge of what happens to students after their final classes. As one religious studies faculty member writes, at present “it’s really more a matter of students keeping track of us than our keeping track of them.” The AAR would like to reverse this dynamic. 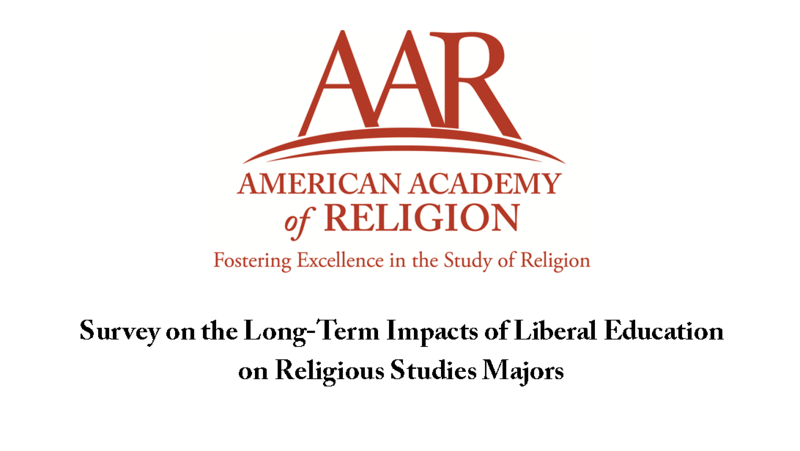 The AAR, with support from the Teagle Foundation, conducted a national survey of religious studies majors in 2014 and the spring of 2015, asking graduates what fields they currently work in, what graduate programs they attended, and how the religious studies major impacted their values and career choices. The Survey Report aggregates the results of 1,675 respondents from 35 participating colleges and universities. The survey is designed to answer via empirical evidence a central question that is asked—often with growing suspicion—by various stakeholders: “What can I do with a major in religious studies?” Learn more about the survey and how your institution can participate by visiting AAR’s website. Over the coming days, RSN is happy to present analysis on the Survey Report from Melissa Wilcox and Charles Mathewes. E-mail rsn@aarweb.org if you have thoughts on the data you'd like to share with readers. Not many people know that my undergraduate degree is in biological sciences, awarded from an institution where molecular biology was the focus and ecology a close second. I enjoyed my major, but I loved my religious studies courses, unaware that it was highly unusual at that time to be learning feminist analysis and queer theory through a religious studies department. Although I had more than enough credits for a minor in religious studies, my institution did not allow minors, and the importance of graduating a term early made a double major impractical. I graduated just a few credits shy of a religious studies major, but on paper it appears that I studied biology in college before starting a master’s program in the study of religion. This combination led to some confusion among people who encountered me during my early graduate work. My roommate, with whom I connected via an old-fashioned binder of listings in the school’s housing office (it was, after all, the mid-1990s), admitted later that she was worried when we agreed to share an apartment. She was pursuing a graduate degree in a completely different area. Would she be able to swear in front of me? Could she tell her favorite sacrilegious jokes? We sorted out that misunderstanding pretty fast; I used a string of choice words to ease her mind, and then shared my own favorite sacrilegious joke. We got along famously after that. But my roommate wasn’t the only one with misperceptions about my chosen field of study. “Oh, are you going to be a priest?” asked no small number of strangers. “No, queer studies in religion,” I stressed. His mouth snapped shut and he immediately busied himself with a magazine, while I contentedly—if a bit uncomfortably—returned to my grading. I share these stories with our undergraduate majors in religious studies (we call it simply “religion”) at Whitman College and hear in return no end of similar tales from them. Very much a product of the “unchurched” Pacific Northwest, our school is ardently secular. Some who come to the major have grown up religious; others have not. But their friends and roommates, in general, don’t see the point in their studies. Their families can be even more of a challenge. “What are you going to do with that?” is a question that many who choose to major in religious studies must face. With college tuition rates skyrocketing even at public schools in the United States, and with neoliberal conceptions of education emphasizing, with increasing stridency, its value strictly as preparation for the corporate workplace, many outside of the study of religion have come to regard our field as an appropriate major only for those who plan to make religious practice and leadership a career. This shift in public priorities is a particularly difficult challenge for programs in the broader history of religions tradition since we teach, as I frequently have to explain to colleagues in other fields, about religion as a human phenomenon and not about how to enrich one’s own religious practice or perspectives (though it must be admitted that our classes may unintentionally produce that side effect for some students). At many schools that house such theological programs, it is rare for even religious studies majors to aspire to a future in ministry. So when parents and other important figures in a student’s life hear of an inclination to major in religious studies, all they can see is a future of unemployment and many years of their young relative sleeping on the couch in their living room. From this perspective, “What are you going to do with that?” is a reasonable question. Most of us who teach undergraduates know that our field can lead to a wide variety of answers to that question. Most of us have seen double majors come through in what many outside of the field would consider improbable combinations: religious studies and pre-med; religious studies and math, religious studies and astronomy—just to name three fairly recent combinations at Whitman. We also know that our alumni go on to successful and highly varied careers. More to the point, many of us are committed to the idea propounded by Nathan Schneider in Religion Dispatches several years ago: “the world needs what religious studies does.” But we’re not always very good at explaining why this is the case to prospective majors and their influential friends and relatives, or to those administrators who regularly turn a baleful eye on our departments as operating budgets continue to dry up faster than California’s water supply. This is where studies such as the AAR’s recent survey of religious studies undergraduate alumni can come in. Many of us have learned to feature alumni on our department websites and Facebook pages, to help students understand that our field can open doors to a wide variety of future interests and careers. But a study of close to 1,700 alumni from thirty-five different colleges and universities can have a much greater impact than our explanations and anecdotes alone. While much in this study will be unsurprising to those teaching in the field who have watched their own graduates go on to a wide variety of futures, some of the findings might startle those outside of our field who wonder what one does with an undergraduate religious studies major. Consider, for instance, the area of employment for those surveyed who are currently employed or have been so recently. Approximately one-fifth, or 20.3%, of these respondents work for a religious organization of some sort, and 13.3% work in higher education (in neither case is more specific information available, such as position within the religious organization or field of teaching). So the best represented single occupation in the survey is pretty much what people outside the field expect it to be, and the second most common is also perhaps an easily predictable result of a major in religious studies. What might be more surprising, however, to those unfamiliar with our field is that these professions make up only one-third of the total sample. In other words, two-thirds of the alumni who participated in this study are in jobs or careers that are unrelated in the popular imaginary to the study of religion. While some might see this as a negative outcome, as though our graduates are losing interest in the field or selling their souls to the corporate world despite our best efforts, I see it as both positive and exciting—proof that what many of us have been telling our students, our colleagues, and, importantly, our administrations for years is in fact true. The academic study of religion teaches skills and perspectives that can apply to and enrich a wide range of future pursuits. Among the most common of such pursuits, each garnering between 5 and 10 percent of the survey respondents, are primary and secondary education, nonprofit and community-organization work, business and finance, law, and medicine and nursing. But there are many more, ranging from information technology and library work through government and public administration to the arts. A high percentage of the respondents are pursuing or have pursued graduate studies; exactly how many is unclear because it’s impossible to tell the extent of the overlap between those studying in theology or religious studies and those studying in other fields. Again, though, it’s worth noting that along with the 35.3% who have pursued graduate study in theology or religious studies, and the 8% who are currently engaged in such study, 11.8% of the respondents are currently in a different sort of graduate program and 42% have pursued one in the past. So an undergraduate degree in religious studies can prepare one not only for advanced study in the same field, but also for other advanced academic study at the master’s and doctoral levels as well as professional degrees such as the JD, MSW, MD, or MFA. Our graduates are going on to do many and varied things with their work lives, and still our majors and prospective majors face the question: “What are you going to do with that?” We’re not doing a good enough job of communicating the diverse and exciting ways our alumni have answered that question, and we need to do better. But we also seem not to be doing a very good job of helping our majors to be aware of the skills they have acquired during their studies, beyond having basic knowledge about different religions. These survey participants may have put community service on their résumés (70% of them said they included such work), but far fewer of them reported having included on their résumés the very skills for which many of us tout our field as an undergraduate major. For instance, only 37% listed “research competencies” on their résumés, and 34% listed “knowledge of ethical standards.” While these were the lowest, only 59% listed the skill that many religious studies departments tout the most: “ability to work with diverse populations.” A similar number—58%—listed the “ability to analyze problems from different perspectives,” while only about half , 51%, included the “ability to interpret data/information in a critical manner.” The largest number, 69%, listed competencies in reading and writing on their résumés. While it’s tempting to remark caustically that at least college graduates who have majored in religious studies think they can read and write, it seems clear that this is less an issue of the skills acquired by our majors—other questions on the survey make it clear that they feel they acquired a wide-ranging set of skills from their chosen major--and more an issue of their ability to understand those skills as practical in an era where the college-educated, to say nothing of those with graduate degrees, are increasingly castigated as having only book knowledge and being ignorant in the ways of the world. We know that nothing could be further from the truth, at least for most of us, so how do we transmit that firmly held conviction to our students and to the world beyond the so-called ivory tower? Interestingly, and perhaps surprisingly, it seems that in some ways our graduates’ potential employers are doing that job for us. In many cases where respondents did not put a particular skill on their résumé, over half of those same respondents encountered questions about that skill in job interviews, and a good number reported using such skills on the job whether or not they had listed them on their résumés. But wait. Aren’t we pandering to neoliberal capitalism by framing the value of our major through résumés, job skills, and future professions? Quite possibly. And yet, it may be important here to distinguish between the ideals we hold for the world we’re a part of and the lives lived and lost while we fight for those ideals. Few college students today have the luxury of choosing a major solely based on their fascination with the topic without thinking ahead to the years following graduation. I use the word “luxury” here advisedly, because in my experience it is only students with vast social privilege—racial, economic, and citizenship privilege in particular—who can quite literally afford to choose a major with no thought for their future income-earning plans. As college tuition in the United States continues to rise to appalling levels, leaving many graduates with student loans the size of a mortgage, concerns about future employment become all the more urgent. This situation also means that it would be disingenuous at best to encourage students into a field that we ourselves see as having no future other than ministry or academia (unless, of course, a student is specifically aiming for one of those professions). Fortunately, with this survey we have solid evidence backing up what many of us have known anecdotally for years: that the academic study of religion is far from leaving its graduates unemployed or trapped in narrow career paths. Instead, our field shares with other transdisciplinary areas of study such as gender studies and ethnic studies the ability to provide college graduates with analytical skills, cultural competencies, and critical facilities that open rather than close doors in a world where multiplicity and nimbleness of skills have become increasingly important to economic survival at all levels of educational access and attainment. Melissa Wilcox is an associate professor of religion and gender studies at Whitman College. What Does the AAR-Teagle Foundation Survey of Religious Studies Majors Tell Us?